Ham + Cheese? Yes, Please! I love reading about the history of food. 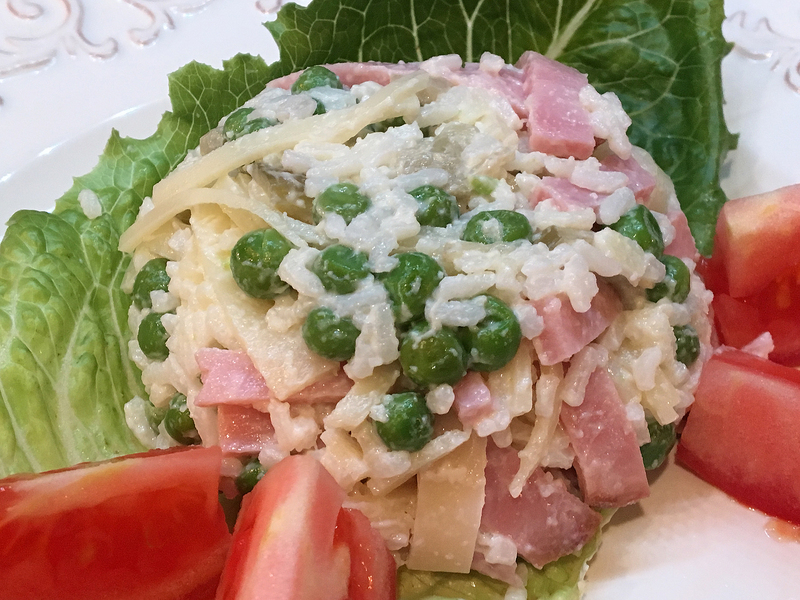 Researching and making my Mom’s recipes has become a hobby of mine and I’m often amazed at the evolution of food through the years – especially during my lifetime; I find that food is in many ways like fashion. I enjoy taking trips down the international food aisle at the grocery store. It’s here I can be surprised and delighted with foods I’ve never heard of… not to mention the interesting and artful packaging. Some foods are no longer available. I discovered this the hard way with one of my early BCN posts when searching for madrilène so I could make this tasty avocado soup. Also extremely hard to find? A garlic cheese roll. If you were a chocolate and caramel lover eating between 1973 and 1981, you likely remember the Marathon Bar which was sweet and savory braided deliciousness that was a treat about as big as a Texas sunrise. Packaging sizes have changed. I often find that cans and packaged foods are trending larger than they did in the good ole’ days. Supersize Me! And give me seconds. And please don’t forget the cheese. Food packaging has changed. Wine in a box? Get real. (Pssst – it is real)! Refried beans in a bag? Just heat ’em and eat ’em! Tomato paste in a tube? Totally tubular! Let’s get rolling! I got super sucker-punched in the belly when I lived in Italy. I thought I knew most everything about the country – Heck, it was my seventh trip there. But living far and away for more than a couple of weeks taught me a lot about the presence and absence of food. Most notably I learned that authentic Italy does not sell or consume yellow cheese. Wait, what?!? Yeah, no yellow cheese! You can imagine the sadness and horror that became my new face as repeated trips to every store in the region produced no yellow cheese. This Texas boy quickly developed a serious health issue when I realized there would be no yellow cheese for me. No homemade mac and cheese. No cheese n’ potatoes. No queso. NO QUESO?!? This is the solid truth – had someone told me there was a store in a province within a one or two day walk from Tuscany, I would have walked there and back just to score a single log of Velveeta. Pinky swear it. Joe will back me up on this. I begged our great friends Jeanie and David who were flying over from Texas for an Italian New Years to please, please, please bring me a block of Velveeta. And if they could also find it in their Texas-sized hearts to tuck some taco seasoning in their bag, I would be eternally grateful. And I am. Eating like a Texan when in Italy begins with the proper ingredients. My dream came true for NYE 2012 when three beautiful blocks of Velveeta arrived along with several packets of taco seasoning, some Pace picante sauce, Rotel and even a bottle of Don Julio tequila. It was a Holiday to Remember! ← Read this post of mine to learn more about shopping Italian style. OK, OK! So what does all this have to do with this recipe? Everything. The optional yellow cheese? Yeah, forget about it. It’s not that you’re in Italy … it’s because this dish doesn’t need it. 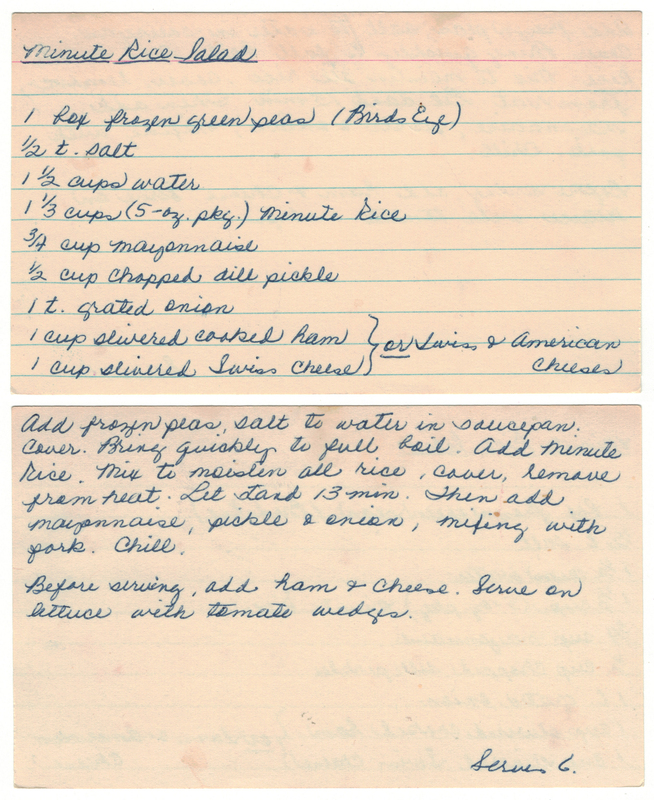 Most notably this is a typical recipe circa 1970s that is less about sizzle and more about sustenance. No fancy presentation draped with a demi-glaze sauce. It’s good ole’ timey tasty. For me the combination of swiss cheese, ham and pickle was a delicious trio that packed a lotta taste. The mayo, onion and peas only sealed the deal. ❤ While perfect as a side salad my appetite was trying to find other ways to enjoy this aside from “just a salad.” I wound-up making lettuce cups out of mine and enjoyed every delicious bite. I think a toasted sandwich filled with the stuff would make the world a brighter place, too. ❤ American Cheese is optional for this dish; I did not use it but I love me some yellow cheese, as the story above reveals. 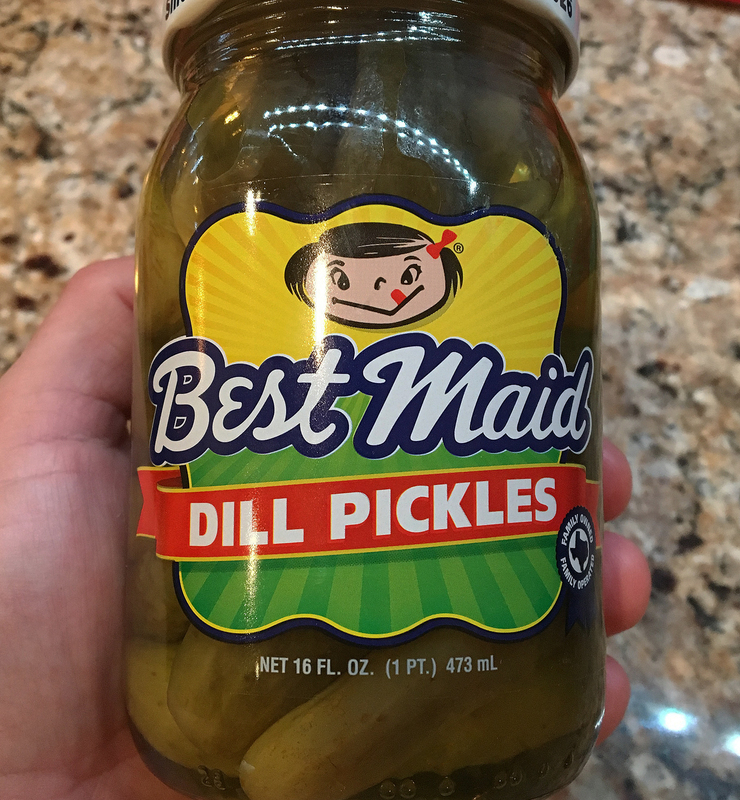 ❤ Dill pickle lover? 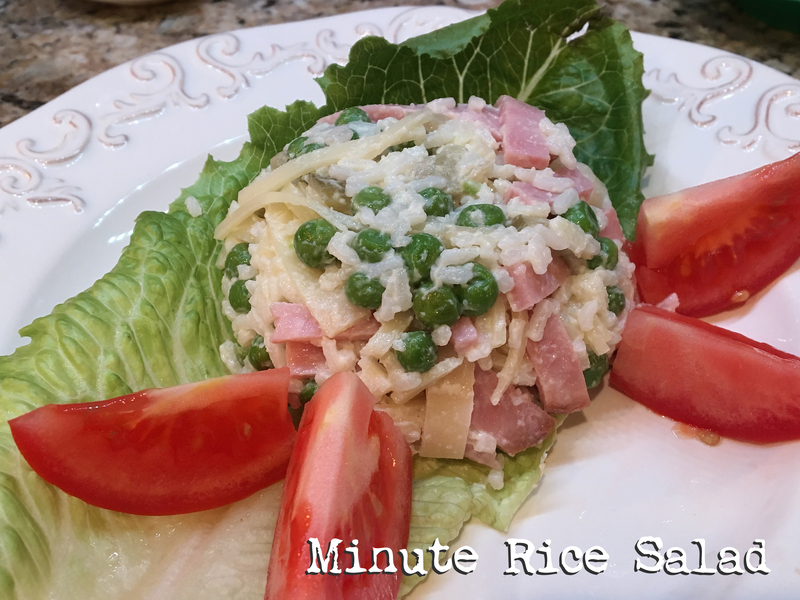 Check out my other post for Sauerkraut Bend’s Potato Salad… plus a video revealing the history behind the little pickle that made Texas famous. 1. Add the peas, salt and water to a saucepan. Cover and bring to a full boil. 2. Add the Minute Rice and mix to moisten all the rice. Cover, remove from heat and let stand for 13 minutes. 3. Add the mayonnaise, pickles and onion and mix/fluff with a fork. Chill in the fridge. 4. When ready to serve add the ham and cheese. Serve on lettuce with tomato wedges and enjoy!